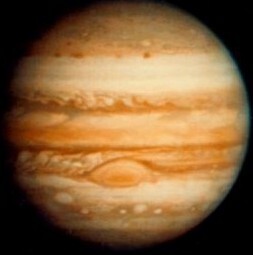 Jupiter has no solid surface, it has a layer of liquid hydrogen. If your weighed 100 pounds on earth, you would way 254 pounds on Jupiter. Jupiter is so BIG!!! It is the largest planet in the solar system! If you had 1,300 Earth's all together, it would be almost the size of Jupiter. Jupiter has massive storms! A storm on Jupiter would cover the whole planet Earth! Being on Jupiter would be like being under water.